In 2009, John Berger donated sixty years’ worth of his papers, accumulated in his stables in the French Alps, to the British Library. The exhibition of that archive, Art and Property Now, begins with pieces from the Forties and Fifties by Berger, Leon Kossoff and others, and runs up to the 2009 collaboration with Alan Kane and Artangel, Life Class. Curated by Tom Overton, who catalogued the archive, and involving many of John Berger’s key collaborators, the exhibition borrows its title from one of the essays that fed into Ways of Seeing (1972), the collaborative series of films and later book which changed the way its viewers and readers understand art and its private and public ownership. The series also drew on G., the novel for which Berger won the Booker Prize and shared half of the proceeds with the Black Panthers. This year is the fortieth anniversary of both works. 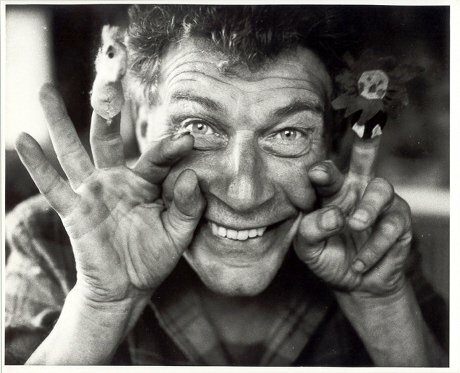 To celebrate John Berger’s 86th birthday on November 5, openDemocracy is this week inviting you to a daily guided tour of the exhibition, which is divided into five sections, by room, connected by the photographer Jean Mohr’s sequence of portraits of Berger. November 5 also marks the beginning of a week-long series of free activities, discussions, workshops, screenings and collaborations in the exhibition: redrawingthemaps.org.uk. Room 1 starts in London in the 1940s, where Berger’s training as a painter eventually ‘dragged’ him into politics, and he became a Marxist critic and broadcaster. De Francia designed the cover for Berger’s first novel A Painter of Our Time (1958), the British Library’s drafts for which form the centrepiece of Room 1. 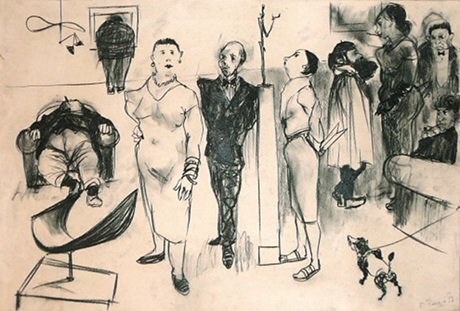 Towards the end of the novel, there’s a scene satirising the London art world, of which de Francia’s sketch Private View is reminiscent; the two men shared a house around this time, as well as what Berger called: "the shameful public role that the artist is forced to play in our society, amusing that small sophisticated section of the public who are queuing up in their own furry night for their own personal salvation via Culture." Eric Hobsbawm’s portrait took on a renewed sense of memorial when its sitter died a month into the exhibition. He also had been a refugee; in his case from Jewish Vienna via Berlin. As one amongst many recognitions of the broad, profound influence his scholarship had, he was recently asked to be the guiding light behind the Serpentine Gallery’s Memory Marathon. Speaking there, Berger remembered learning from Hobsbawm that history was “something mysterious”. 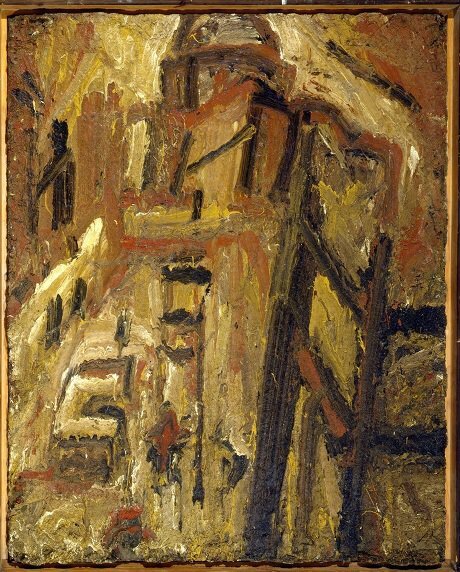 Back at Art and Property Now, Hobsbawm’s painted likeness faces over to the mysterious historical weight of Leon Kossoff’s St. Paul’s Building Site (1954), a central image of a city that had only narrowly – and only recently – survived the menace of Nazism. It captures the smoggy moment when Berger, de Francia, and Hobsbawm met to discuss issues of the day with figures like Kenneth Tynan, Isaac Deutscher, John Willett and J. D. Bernal; de Francia’s portrait of the latter is in the National Portrait Gallery. This was the Geneva Club, an attempt to create the atmosphere of European café culture at in the upstairs room of the Argyll Arms near Oxford Circus. 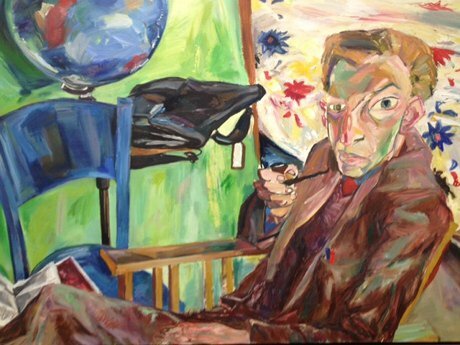 Hobsbawm's portrait, painted in 1955, captures a moment in this history just before what the historian called ‘the political equivalent of a collective nervous breakdown’, when the Soviet crushing of the 1956 Hungarian Uprising, and Khrushchev’s “secret speech” denouncing Stalin’s crimes forced re-evaluations which tore the world communist movement apart. Hobsbawm remembered that the Communist Party of Great Britain lost ‘a quarter of its members, a third of the staff of its newspaper, the Daily Worker, and probably the bulk of what remained of the generation of communist intellectuals of the 1930s and 1940s.’ But, as Donald Sassoon explores in his obituary, Hobsbawm stayed, publically criticising it from within: a decision that looks likely to define his legacy. Neither de Francia nor Berger had been party members, despite appearances; Berger told Anthony Barnett that he was initially barred from entry, and then later, when they tried to recruit him, he refused. Berger’s legacy may be defined by his decision to support the party from without; a stance around which hinges the complex fiction of his first novel, A Painter of Our Time. "I believe they (Soviet artists) are creating the foundations of a true tradition, whereas we, for the most part, are destroying the tradition we inherited. A true tradition can only be built on the general awareness that art should be an inspiration to life not a consolation." The sculpture of Peter Peri, another Hungarian, fit these criteria: Berger called it ‘unwanted concrete with a gritty truth in it’, testifying, even in its material, to the revolutionary future proposed by Marx, and celebrating the class that would bring it about. Monumental Head, also in Room 1, could be one of Peri’s neighbours in Camden, whom he thought, "also entitled to become the subject of an artist’s work. I have recognised that he too is a useful member of our society, his work is also essential." Peri, Antal, and other of Berger’s émigré intellectual friends – perhaps even Hobsbawm – are all represented by aspects of the novel’s main character, Janos Lavin, a Hungarian refugee painter. When Janos disappears, apparently to fight in the 1956 Hungarian Uprising against Soviet rule, John finds his diary, and tries to piece together what has happened to him. Particularly apt, then, that the novel can be represented in the exhibition by one of the BL’s four hard-back notebooks of drafts for it, filled with cut and pasted text, doodles and clippings from The Daily Worker on contemporary Hungarian events. The character John can’t be sure, but he would like to believe Janos went to fight on behalf on the side of the Soviets. Berger thinks that the book was "virtually, practically suppressed": it was remaindered by the publishers, Secker & Warburg in 1961, before being picked up by Penguin in the Sixties and selling quite well. The initial reviews had been, unsurprisingly split down political lines; the most memorable of them being the ex-communist Stephen Spender’s for the Observer, in which he compared it to the Nazi "smell of shootings and prison camps" in Joseph Goebbels’ early, semi-autobiographical novel Michael (1929) – an ideological trope which resurfaced on the comment threads of Hobsbawm’s obituaries and notices almost as soon as they were written. And, in the case of A. N. Wilson’s, formed the substance of the article itself. "it would be cunning strategy on your part to make material things unrecognizable, since the struggle concerns things and it is in the world of things that your masters have the most to answer for." Then again, the book also hadn’t sold well. Though the method is uncertain, one way or another it was certainly Capitalism that did for the first edition of A Painter of Our Time. As we can see in the books' background, Berger’s teachers and models are from outside the English Literary canon – unless you include Joyce and Yeats – his work, consistently critical of the very idea of the ‘canon’. But in the future, this book could be put on syllabi as a literary response to the crisis of 1956 in the same way Middlemarch is looked to to illustrate the impact of the Reform Bills, or Milton, the English Revolution. It reads, at times with a strange mixture of journalistic speed and undigested historical weight – and very like a first novel. But it contains the great question of a part in our history that – if we are to be guided by the viciousness of debate that the last month or so has revived – still divides public life. For Tony Judt, a historian of a generation after Hobsbawm’s who awfully predeceased him, 1956 was a watershed after which "communism was forever to be associated with repression, not revolution". With the Suez Crisis, the year also signalled the accelerated end of the British Empire, and Room 2 deals with Berger’s response to the afterlives of both of these world powers. By 1960, he was writing that ‘revolutionary examples and possibilities have since multiplied’, and in 2005, defined himself as ‘still amongst other things a Marxist’. See also Let Vietnam Live! From 1965-71, John Berger was working on the novel that would win him the Booker Prize, G. (1972); the dateline on the last page lists Geneva, Paris and Bonnieux as the locations. He had left England in the Sixties to become a ‘European writer’, though his most recent book – A Fortunate Man (1967), a blend of his text with the photographs of his friend Jean Mohr, looks at the life of a GP in the Forest of Dean. Berger was in England for Oxford Vietnam Week (Jan. 25 – 31 1967), where he delivered this speech; it was printed, with another by the Reverend Sidney Hinkes (1925-2006) an ex-paratrooper who was also arrested that year for his involvement for an anti-racism protest outside an Oxford hairdresser’s. In 2009, John Berger donated sixty years’ worth of his papers, accumulated in his stables in the French Alps, to the British Library. The pamphlet, Let Vietnam Live! came to the British Library loose as part of the archive.